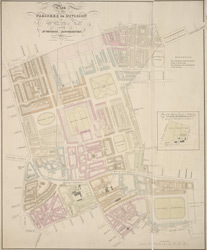 This map of St Pancras area shows the parish divisions within St Giles in the Fields and St George's, Bloomsbury. It includes a plan of the Burial Ground and Chapel of St. Giles in the Field, adjoining the church yard of St Pancras. Montagu House was sold in 1755 to house the British Museum. It was demolished to make way for Smirke's building in the 1840s.